Crimson Frost Books: GET A PUNCH OUT OF LIFE! RECIPE FOR CELEBRATION PUNCH. GET A PUNCH OUT OF LIFE! RECIPE FOR CELEBRATION PUNCH. GREAT SUMMER PUNCH FOR A GET TOGETHER AND JUST FOR FUN! 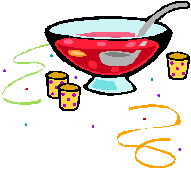 PUNCH BOWL NEEDED THEN MIX ONE LARGE CHILLED JUG OF RED HAWAIIAN PUNCH WITH TWO CANS OF CHILLED SEVEN UP. ADD A SMALL CAN OF CHILLED PINEAPPLE CRUSHED PIECES AND ITS JUICE. THEN TOP IT OFF WITH ORANGE SHERBERT. MIX IT A BIT AND SERVE IT UP. WOW FANCY AND DELICIOUS! A GREAT PLUS FOR ANY PARTY. THIS PUNCH HAS BEEN A HIT AT BABY SHOWERS, WEDDING SHOWERS, GENERAL PARTIES AND JUST AN ORDINARY DAY. EVERYONE LOVES IT AND IT IS EASY TO MAKE. I JUST THOUGHT I'D SHARE THIS WITH YOU ALL!